TAGLINE: Broadway Pizza has been serving great pizza in America for over 60 years! ORIGINS: Broadway Pizza Brooklyn Park has the New York style and the original Broadway-style deep dish pizzas. They also offer a complete gluten-free menu to its customers. Broadway Pizza Brooklyn Park is rated four out of five on TripAdvisor. Broadway Pizza was founded in 1953 by an Italian called John Spallacci. He was born in Gorviano Italy and moved to Minnesota. He brought from Italy his own personal pizza recipe. Later on, in 1976 a man called Eddie Peck bought the business from John Spallacci. Eddie ran the business with his wife Dorothy and his mother Mamie. Eddie Peck had their skill of making sausages from scratch. Mamie`s job was making great tasting sauces. Word spread of the great pizza`s that Eddie peck made and his business became a major hit! Broadway Pizza Brooklyn Park is located at 8525 Edinburgh Center Drive Brooklyn Park Minnesota 55443. Their contact number is 763-488-8484. You can check out their website at http://www.broadwaypizzabrooklynpark.com. Broadway Pizza in Brooklyn Park is an Italian restaurant. Broadway pizza is opened at 11:00 AM every day. You have the option to dine in, order on the phone or online or have taken out. You can order online at www.doordash.com. Kids eat free but there are however some restrictions. The child must be ten years or younger. The free meal is only eligible if an adult meal is purchased. You can only dine in and there is no drink included in the meal. Brooklyn Pizza Broadway offers Banquet Catering for all occasions. Contact them today for your all wedding, parties, business dinner or family event. There is a private dining area, a full bar and a patio for outside dining. The original appetizer sampler – This special comes with 5 pieces of wings, a sauce of your choosing, four pieces Italian cheese bread, golden brown onion rings. This is served with original Broadway sauce. You can also choose between the ranch and blue cheese dressing. 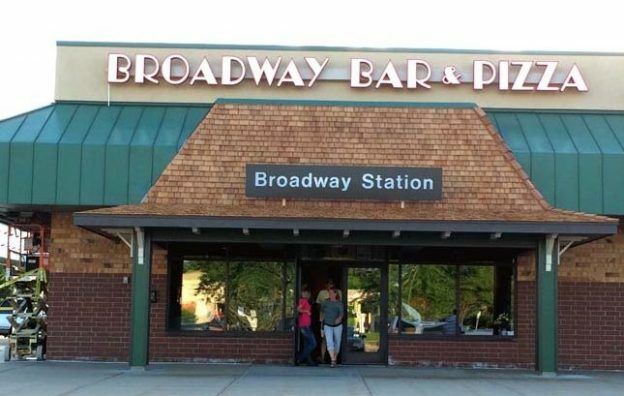 Broadway Pizza Brooklyn Park offers a wide variety of appetizers, salads, pizzas, and sandwiches. Italian Cheese Bread – This is a thick chewy bread brushed with butter and mozzarella and is placed in the oven until golden brown. It is served with an original Broadway sauce. Price: $13.99 Serving: one dozen. Garlic Toast – Made with Italian bread, garlic butter and baked until golden brown. Cost: $8.99 Serving: one dozen. Savory and boneless wings are made in your choice of sauce. Breaded wings come with the sauce served on the side. Wings are served with celery sticks and your choice ranch, blue cheese or chipotle ranch dressing. Cinnamon Sticks – Oven made and very crispy on the outside. Sprinkle with cinnamon and sugar and served with sweet icing. Price $12.99 serves ten to twelve people. Party salad – Salad is made with tomatoes, greens, cucumbers, croutons, and red onions. Hoagie platter – Eight large hoagies served on a platter. You have the choice of turkey, Italian, turkey club, or ham and cheddar. Price $54.99 USD Serves twelve to sixteen people. Broadway serves many options for Pasta Lovers. All pasta is served with garlic bread. BAKED PENNE AND MEATBALLS – Penne pasta with authentic Broadway sauce and homemade meatballs. With mozzarella and baked to golden perfection. Price $44.95 Serves eight to twelve persons. CHICKEN FETTUCINE NOODLES – Fettucine noodles mixed with garlic alfredo sauce and grilled chicken on top. Price $44.95 USD Serves eight to twelve people. SPAGHETTI AND MEATBALLS – Spaghetti served with Broadway’s original sauce with homemade meatballs. BAKED LASAGNA– Pasta layers with a four-cheese blend, herbs, sausage, ground beef, and original Broadway sauce. Price $44395 USD. Serves eight to twelve people. 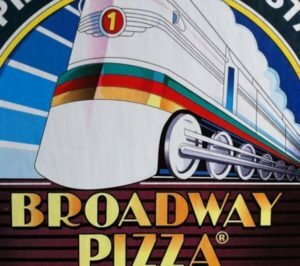 Broadway is known for its great tasting pizza since 1953. You can build your own pizza with up to five ingredients. Broadway Pizza uses a low-fat mozzarella and you have several choices of crust. You can choose from Original crust, whole wheat thin, New York style, Broadway-style and deep dish. You can choose from the many toppings available. Classic Deluxe No 1 seller! A combination of cheese, sausage, pepperoni, mushrooms and green pepper. Vegetable-Filled Made with low-fat mozzarella, and tomatoes, mushrooms, onion, green pepper and green olives. Island Made with Canadian bacon, herb-seasoned chicken and pineapple chunks. Chicken Club Made with herbed seasoned chicken, bacon, tomatoes, romano, parmesan and Mozzarella with garlic alfredo sauce. Pork and Kraut Made with premium Canadian bacon, crisp bacon, onion topped with mozzarella! For all your Pizza needs Broadway Pizza is here to fill them! Every one loves Broadway! Pizza done the right way!